Chelsie: Another great Diamond Jubilee Afternoon Tea we found on our quest is available at The Hyatt Regency- The Churchill. The Hyatt Regency- The Churchill is part of an elite few that has recently been given an 'Award of Excellence 2012' by the Tea Guild. Kate and I visited this hotel in November 2011, and we both really enjoyed our experience. In light of this it seemed only logical to see what The Hyatt Regency- The Churchill would offer for such a prestigious event! Kate: Chelsie and I spent some time ogling the menu, and we both agreed that it looks devine! We particularly like the variations and novelties included in the pastries and think this would be a lovely way to celebrate the Diamond Jubilee! The Jubilee Afternoon Tea is served every day between 3pm and 6pm from Friday 4th May until Wednesday 13th June. The indulgent pastry selection includes beautiful English pastries such as- Kentish Strawberry Sundae with a union Jack Flag, Royal Chocolate Cup Cake with its own Crown, Golden Gingerbread with Eggnog Cream and Classic Eccles Cakes served from a Royal Crown. The Jubilee Afternoon Tea is served with a fine selection of exquisite teas, and for those guests looking for an extra special treat, a Champagne Afternoon Tea is available. The Champagne Afternoon Tea also includes a glass of Sommelier’s (a trained and knowledgeable professional) choice of Champagne. 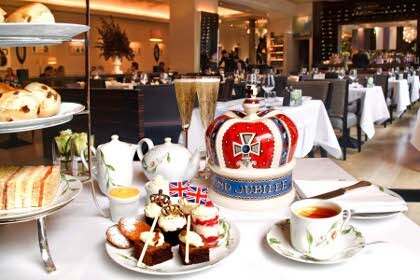 The Jubilee Afternoon Tea is priced at £25 per person and £32 per person including a glass of champagne.